This is part one in a series of post about how to improve your photography skills. The target audience would be knitters who spend a lot of time knitting beautiful things and want to have a beautiful photo capturing all that hard work, as well as knitwear designers (new or established) who want to take their own photography for their published patterns. A good photo can make or break a sweater pattern. A good photo can show off a design to it’s true potential, or it can distract and distort making the design look much less then it actually is. This is a hard and important truth. A bad photo can ruin the first impression your knitwear makes, or a dull photo can just make it all very uninteresting. Some people come to photography naturally, others take a long time to learn. Like many things in life, it is 90% hard work and 10% inspiration or talent. You do not have to have some sort of fancy camera to take good photos, but a newer model point and shoot will be your best starting point. I have an older version of this Canon PowerShot (mine cost a bit more back then too!). 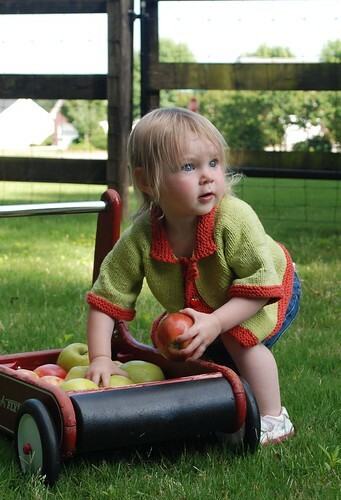 I started using that camera after my daughter was born, and when she was 6 months old and I designed my first sweater, I decided it would be worth the investment to buy a Digital SLR (This is what the pro’s use, but you will soon find out there are very affordable “amateur” DSLR options. A point and shoot camera is fantastic for practicing your photography skills, thinking about natural light and composition and styling. I am not going to explain how to get the pictures off your camera. Every camera and computer is different. I love my Apple Macbook because I never have to install the camera software, I just hook my camera up and turn on the computer and my mac takes over. Your best bet for help is to ask your cousin, your sister, neighbor, co-worker. They can show you much faster, it will be easier for you to understand and remember. Also you will need to buy a nicer memory card then what comes with the camera, the ones that come with are tiny. To determine what sort of card I need to buy, I normally just go to amazon, find my camera and scroll down to see what accessories go with it, and what other items users have bought with it. As I’ve wanted to increase my photography skills, I went looking on the web for help. I found a lot of “paid” forums and I did join two of them, hoping desperately to find people to help me improve my technical skills. I found the paid forums to be a waste, and even though I was able to get feedback on my photos, it came from people who I didn’t know at all. Often I would go check out their sites and not be that impressed by their photography. I realized I needed to be getting feedback from people I respected, people who took photos that looked like what I wanted mine to look like. Don’t just go posting around the internet asking for random feedback, you may not wind up getting what you wanted, or inaccurate information and personal opinions. Or you may wind up not getting any feedback at all. One of the few places I like online is I Heart Faces. It has a lot of women, and a lot of “moms” and as I take photos of kids, it was good to find a place with people taking similar photos. There is also a lot of wedding and engagement photos, which applies just as well to adult knitwear photography. So find some of your favorite photographers, friend them on facebook, follow their blogs and ask questions! The Pioneer Woman has loads of fantastic photography tutorials on her site. I love her photography, so I trust what she has to say and often refer back to her tutorials. My next piece of advice is do not run out and get photoshop, or try to get all fancy in photoshop. Focus on making your photos come out of your camera looking good, or looking better. You can do stuff with photoshop later, but often it just makes photos look processed and dated. If you really are interested in photography, then I suggest a Nikon D90 (a Nikon or Canon would be what I recommend for a DSLR). I currently use a D80 for all of my photography. It’s a fantastic camera, and the D90 does video which is a lot of fun. This is an entry level semi-pro camera. The cheapest way to go about it is to buy the camera without the lens, but if you have the cash spring for the basic lens it comes with. You can always buy it later though. Then buy a “niffy fifty” which is a 50mm lens. The 1.8 version of the 50mm is just $100! This is the lens I use for all of my pictures. That number it has, 1.8 is what makes it so great. It means it can work in really low light. It’s also so cheap because it can not zoom in or out, its just a “fixed focal length” lens, but don’t worry about the technical jargon, just buy it. You won’t regret it. Here is also a fantastic source for the best camera’s for different uses and Nikon vs Canon reviews. I grew up with a father who has always been taking photographs. He was a combat photographer in Vietnam, and he took photos for poster companies of rock stars in the 60’s and 70’s in Los Angeles. He has no formal education in photography, and is a true expert (in particular in film, and he does use a Digital SLR now). He started out around 10 years old following around a real estate agent, getting paid to take photos of houses. I grew up with all of this, and often followed him on weekends to weddings to watch him take photographs. In high-school I took a film photography class, developing in a dark room. I was the staff photographer for the school newspaper, and photographing night football games with my father is one of my favorite memories. I never really thought about being a professional photographer. It was just something I enjoyed and I often was able to use my dad’s fancy equipment. 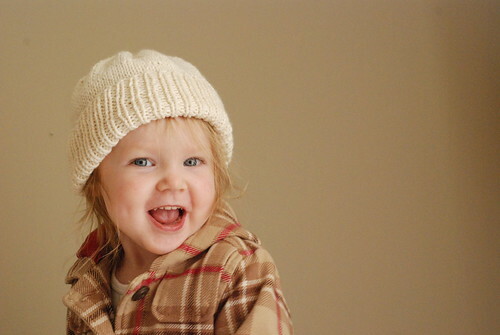 A very plain hat that comes alive with a happy child and lots of good light brightening up the face. Thank-you for this wonderful post! I’ve been struggling with taking yarn photos lately, especially with certain colours and I think is going going to be invaluable information for me. You certainly do inspire us amateur photographers. Thanks for the tips. It’s been so inspiring to watch your blog (and your patterns!) grow and develop along with your girls. This is fantastic! I always find the photography part of my knitting and spinning the hardest. Thanks for sharing your tips! We have another thing in common-both school newspaper photographers! Woo hoo! I think you have progressed much better though 🙂 Great idea for a blog series. Great ideas, looking forward to reading more. 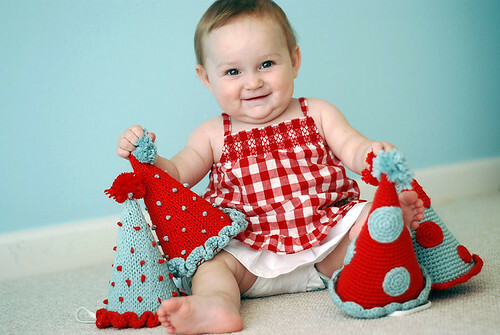 Wonderful info and fantastically cute pictures. I can’t wait to read more and see more of your photos. What a wonderful article! Thank you so much for the great reading material. Wow! This was an impressive article. This is an area that I really need to improve in. Thank you for sharing. Can’t wait to read Part 2. Pioneer Woman’s photos are great! And so are yours! Nikon D90 is quite expensive. Is there a cheaper alternative? Or does one have to invest that much on a camera? Lucy, compared to a true pro camera the D90 is not very expensive at all, in particular if you get the body without the kit lens, and then get the cheaper 50mm lens. The cheaper alternative is the D5000 but I don’t have that camera so I can’t vouch for what it can do (Ken Rockwell highly recommends it), and I believe it has some limitations but I am sure it is better then a regular point and shoot! I was just talking to my husband today and we are discussing upgrading our old point and shoot, so this is a very timely article for me. Thanks for the recommendations! WOW! Thanks for the tips!I LOVE your photography and am inspired by this article! Can’t wait for the next installment! I found this blog post series through a random web search, while I was trying to get information about good cameras for photographing knitting. Thank you -so- much for this! In addition to some great ideas and insight on how to buy a camera (what features to look for and not look for), it’s also just so useful to have the information laid out about how to photograph knitting/crocheting/yarn/etc. I’m pretty much completely new to the world of photography, so this has been a amazing read for me.